The White House issued a sweeping proposal Thursday to shrink the federal government, including merging the Department of Labor and the Department of Education into one federal agency. 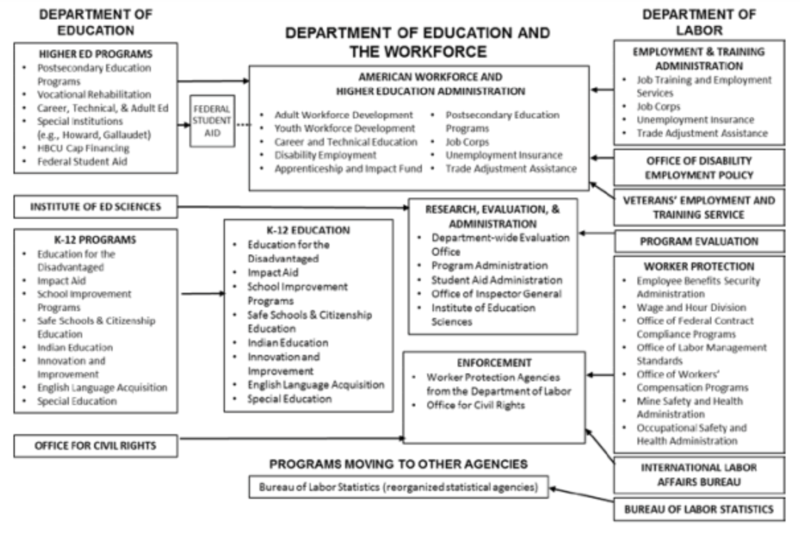 The plan for the combined agency, called the Department of Education and the Workforce, comes as the result of a directive that Office of Management and Budget director Mick Mulvaney issued over a year ago, in which he attempted to create ways to combine departments that had overlapping programs, the Washington Post reported. The proposal would merge all of the existing Labor and Education programs into one single department with four sub-agencies focused on K-12 education; higher education and workforce development; enforcement; and research, evaluation, and administration. But it's not final — according to the Wall Street Journal, which first reported on the consolidation using unnamed sources on Wednesday. Many of the changes still require approval from Congress. Screenshot from White House plan, titled "Delivery Government Solutions to the 21st Century"
“This effort, along with the recent executive orders on federal unions, are the biggest pieces so far of our plan to drain the swamp. The federal government is bloated, opaque, bureaucratic, and inefficient. President Trump understands the frustration felt by hardworking Americans,” Mulvaney told Politico in a statement. “I am eager to work with my colleagues across the executive branch and in Congress to deliver a more trusted and efficient government that puts the American taxpayer first." The goal of consolidating and breaking down these agencies is to make it easier for Americans to move from their education directly into their career, according to the administration. One department overseeing both functions of the government could also save a lot of money. But backlash is already rising, especially in the education community. To start, the president of the American Federation of Teachers, Randi Weingarten, worries that the move could gut funding for public schools, civil rights, and equity protections. The plan to consolidate Labor and Education isn’t unique to the Trump administration, though. In the past, Republicans have expressed interest in getting rid of the Department of Education altogether — it employees few people but has a huge budget. The Labor Department, on the other hand, has more employees, a smaller budget, and programs in place to train workers. Here's the White House's full plan, via Politico. But the pages 23-28 detail the plan for the Departments of Education and Labor.